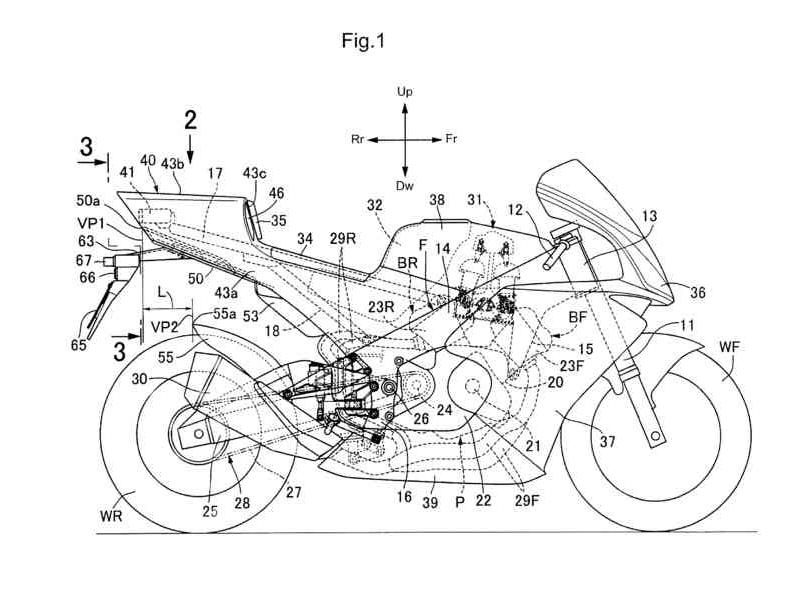 NEW Honda V4 Sport Bike Patents Filed = 2018 1000 cc CBR / RVF? Affordable RC213V-S? 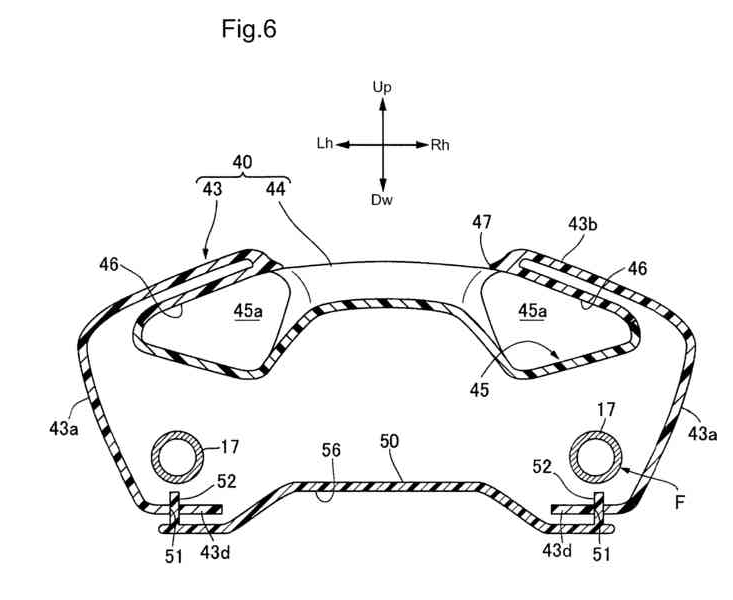 It’s almost like Honda filed these patents under odd-names to be sneaky – possibly? The first patent below is a “Rear Structure Patent” whereas the second patent below is for a “Step Structure Patent”. 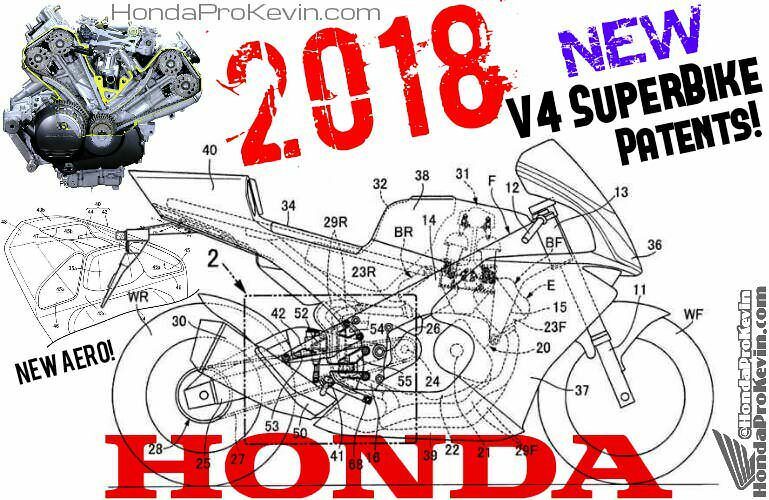 Did they do this to not draw a lot of attention towards what looks to be an all-new V4 motorcycle / superbike in the works from Honda? Could this be an ‘affordable’ sibling to the 2016 RC213V-S so us mere mortals could possibly own one of Honda’s V4 marvels and ride it on the street and track? Just in case you’re not familiar with the RC-213V-S, it had a price tag exceeding $180,000! That’s why I used the term “affordable”. 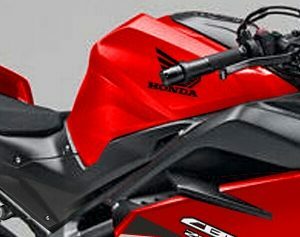 Could this be a 2018-2019 V4 sport bike that Honda has in the works? Could it be the infamous RVF1000R that’s been rumored lately? Anyone else as hopeful as I am that this project makes it to the market and keeps a price-tag below $25,000? What’s the most you would pay for something with the electronic technology of the new 2017 CBR1000RR SP2 but packed a V4 engine in 2018 or 2019? 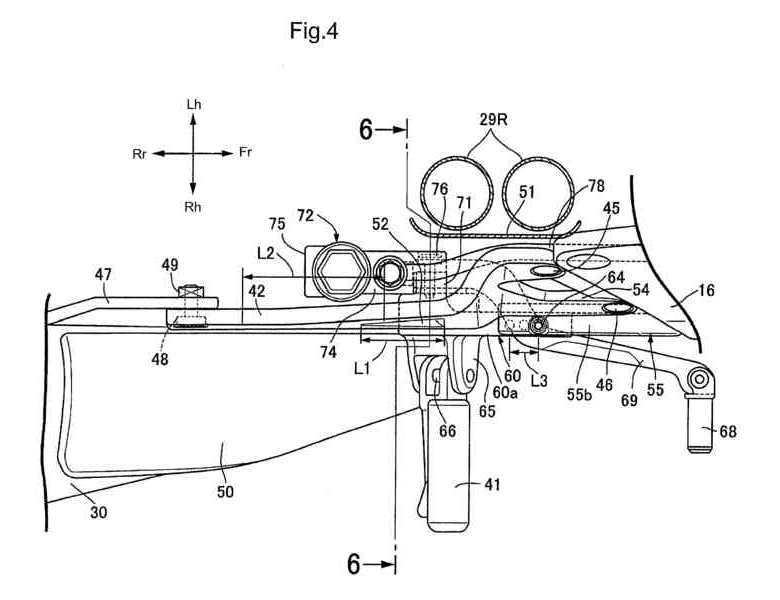 Check out the last Honda V4 Motorcycle Patent blog post here. Title: Rear structure of motorcycle. Abstract: A motorcycle with a power unit for reducing the running resistance of a flow of air by effectively straightening the flow of air while ensuring the visibility of a tail light unit. The tail light unit emits light toward the rear of the vehicle and is arranged in a rear cowl which covers a rear part of the body frame at least behind an operator’s seat. A straightening plate covers a rear part of a body frame F from below while allowing air flowing from a power unit to the rear to be straightened and discharged to the rear of the vehicle. The straightening plate is fixedly arranged below a rear cowl, which covers the rear part of the body frame from the side and above, behind an operator’s seat. . The present application claims priority under 35 USC 119 to Japanese Patent Application No. 2015-157050 filed Aug. 7, 2015 the entire contents of which are hereby incorporated by reference. The present invention relates to a motorcycle, in which a power unit exerting power for driving a rear wheel is mounted on a body frame with a tail light unit for emitting light toward the rear of the vehicle being arranged in a rear cowl, which covers a rear part of the body frame at least behind a rider’s seat. More particularly, the invention relates to an improvement in a rear structure of a motorcycle. Japanese Utility Model Registration Application Publication No. 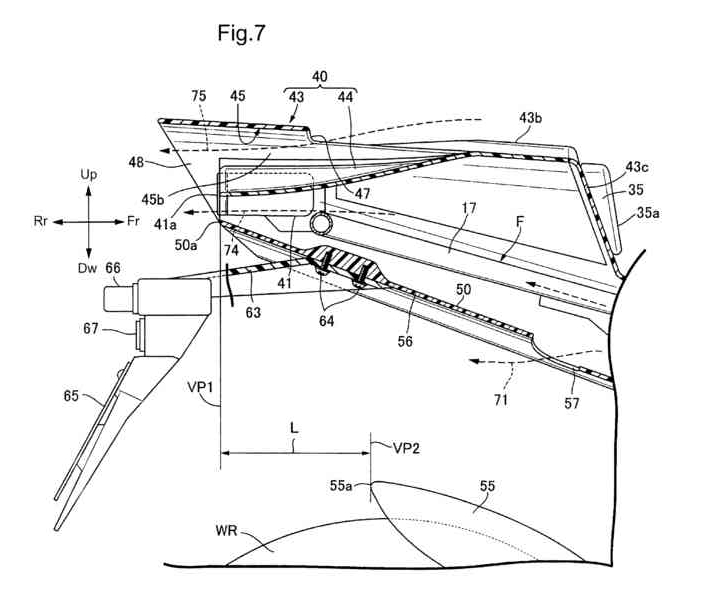 Hei 4-37089 discloses a rear cowl of a motorcycle that is configured such that air that flows in from side faces of the rear cowl cools an exhaust pipe inside the rear cowl and is discharged from an upper face of the rear cowl. Although a flow of air needs to be straightened more effectively to reduce the running resistance of a motorcycle, a straightening of the air flow is insufficient in the structure disclosed in Japanese Utility Model Registration Application Publication No. Hei 4-37089. Another conceivable method to reduce running resistance is to reduce the projected area of the rear cowl on a vertical plane extending in the vehicle width direction. 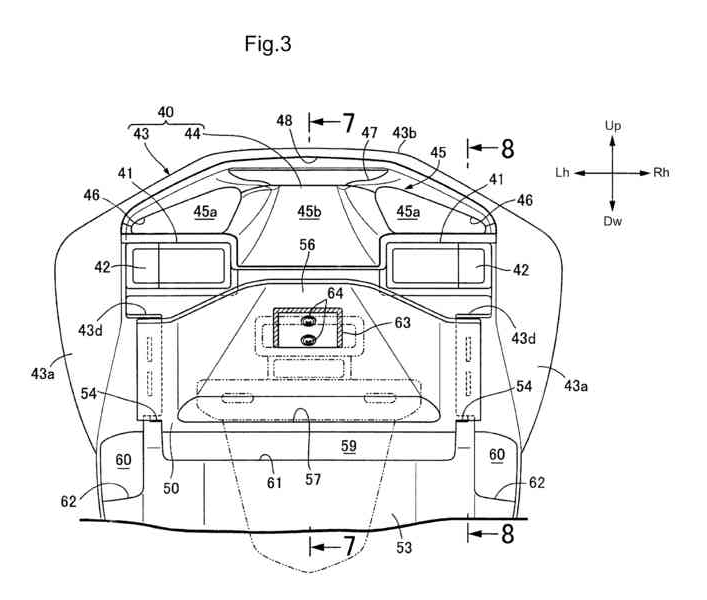 However, since the tail light unit needs to be sufficiently large to ensure the visibility of the tail light unit, it is difficult to reduce the running resistance by reducing the aforementioned projected area. The present invention has been made in view of the foregoing, and aims to provide a rear structure of a motorcycle that can reduce the running resistance by straightening a flow of air more effectively, while ensuring the visibility of a tail light unit. To achieve the above objective, according to an embodiment of the present invention, a motorcycle is provided in which a power unit for exerting power for driving a rear wheel is mounted on a body frame with a tail light unit, for emitting light toward the rear of the vehicle, being arranged in a rear cowl, which covers a rear part of the body frame at least behind an operator’s seat. A straightening plate is provided, which covers the rear part of the body frame from below, while allowing air flowing from the power unit to the rear to be straightened and discharged to the rear of the vehicle, is fixedly arranged below the rear cowl, which covers the rear part of the body frame from the side and above, behind the operator’s seat. Also, according to an embodiment of the present invention, part of a rear edge of the straightening plate is arranged below a rear edge of the tail light unit. According to an embodiment of the present invention, a hugger fender covering the rear wheel from above is arranged below the straightening plate with the rear edge of the straightening plate being arranged behind a rear edge of the hugger fender. 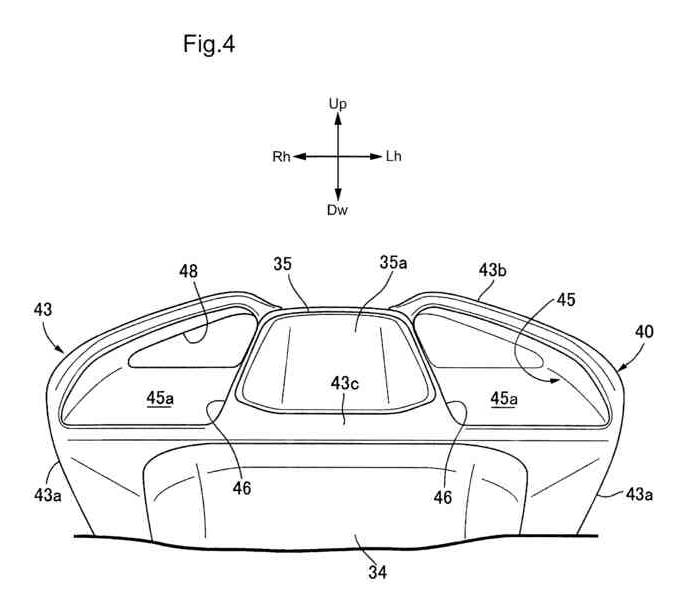 According to an embodiment of the present invention, an air flow passage allowing air to flow in the longitudinal direction of the vehicle is formed in the rear cowl with an exhaust port of the air flow passage opening toward the rear around the tail light unit. 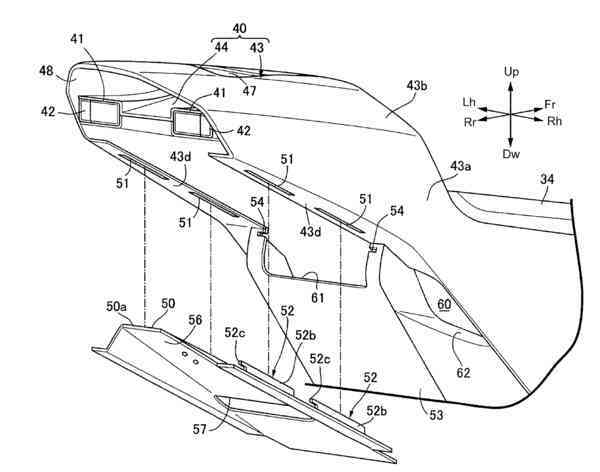 According to an embodiment of the present invention, a front wall portion facing the vehicle front is provided in the rear cowl behind the operator’s seat with a first intake port taking air into the air flow passage from the front is formed in the front wall portion. A second intake port for taking air into the air flow passage from the front is formed in a ceiling wall of the rear cowl, behind the first intake port. A total opening area of the first and second intake ports is set larger than an opening area of the exhaust port wherein the air flow passage is formed such that air flowing in from the first and second intake ports is mixed and discharged from the exhaust port. According to an embodiment of the present invention, a rear under cover covering the body frame from below under the operator’s seat is connected to the straightening plate, in such a manner so as to form air flow holes with the straightening plate and the rear cowl. 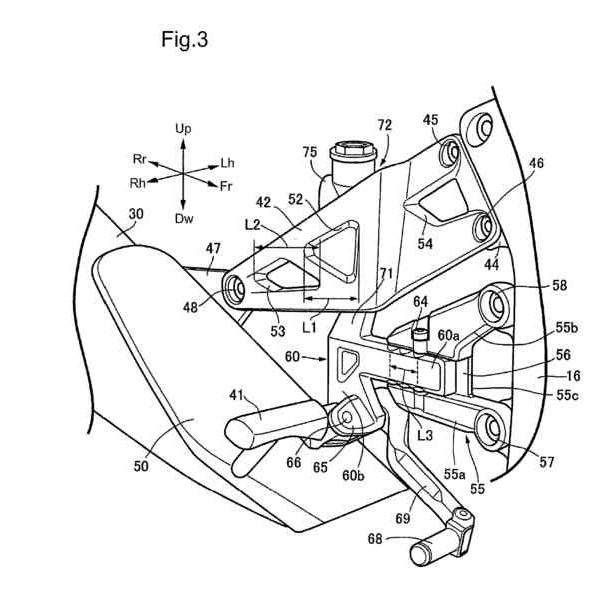 According to an embodiment of the present invention, a pad, which can be brought into contact with the lower back of a rider sitting on the operator’s seat, is provided on the front wall portion with first intake ports arranged on both sides of the pad being formed in the front wall portion behind a front face of the pad, in such a manner so as to open toward the vehicle front. According to an embodiment of the present invention, since the straightening plate is fixedly arranged below the rear cowl, the straightening plate can straighten a flow of air. Thus, the running resistance can be reduced while ensuring visibility of the tail light unit. According to an embodiment of the present invention, part of a flow of air straightened by the straightening plate flows below the rear edge of the tail light unit. Thus, mud and dust thrown up by the rear wheel are less likely to attach to the tail light unit, and visibility of the tail light unit can be increased. According to an embodiment of the present invention, the straightening plate prevents mud and dust thrown up by the rear wheel from attaching to the tail light unit. Thus, the hugger fender, which is arranged below the straightening plate while covering the rear wheel from above, can be downsized, since the rear edge of the straightening plate is arranged behind the rear edge of the hugger fender. 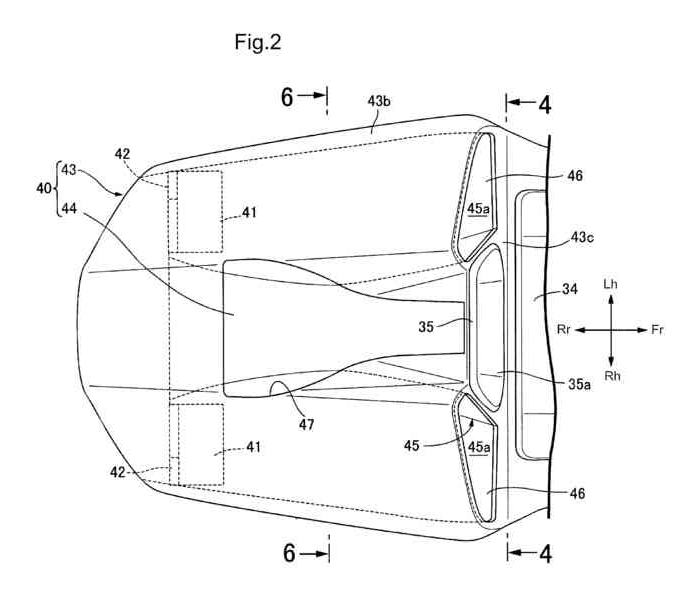 According to an embodiment of the present invention, the air flow passage allowing air to flow in the longitudinal direction of the vehicle is formed in the rear cowl, such that the exhaust port of the air flow passage opens toward the rear around the tail light unit. Thus, running resistance can be reduced even more, by allowing a flow of air to flow through inside the rear cowl in the longitudinal direction of the vehicle. Also, since a flow of air having flowed through the air flow passage is discharged to the rear from around the tail light unit, mud and dust thrown up by the rear wheel are less likely to attach to the tail light unit, and visibility of the tail light unit can be improved even more. According to an embodiment of the present invention, the first intake port of the air flow passage opens toward the vehicle front behind the operator\’s seat, the second intake port of the air flow passage opens toward the vehicle front behind the first intake port, and air flowed in from the first and second intake ports is mixed and discharged from the exhaust port, which has a smaller opening area than the total opening area of the first and second intake ports. Thus, accelerated a flow of air is discharged to the rear from around the tail light unit, so that mud and dust thrown up by the rear wheel are less likely to attach to the tail light unit, and visibility of the tail light unit can be increased. 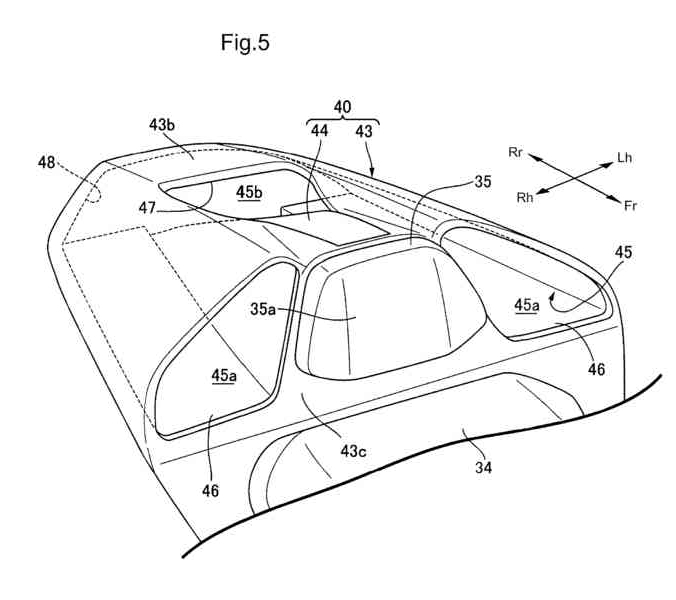 According to an embodiment of the present invention, the rear under cover covering the body frame from below under the operator\’s seat is connected to the straightening plate, and the air flow holes are formed with the straightening plate and the rear cowl. Accordingly, a flow of air having passed through the air flow holes flows below the tail light unit. Thus, mud and dust thrown up by the rear wheel are less likely to attach to the tail light unit, and visibility of the tail light unit can be increased. According to an embodiment of the present invention, the first intake ports of the air flow passage are arranged on both sides of the pad, which is provided in the front wall portion of the rear cowl such that it can be brought into contact with the lower back of the rider sitting on the operator\’s seat, and the first intake ports open toward the vehicle front behind the front face of the pad. Thus, even when the lower back of the rider sitting on the operator\’s seat is in contact with the front face of the pad, the lower back of the rider does not block the first intake ports, and therefore a flow of air can be introduced into the air flow passage through the first intake ports, and running resistance can be reduced. 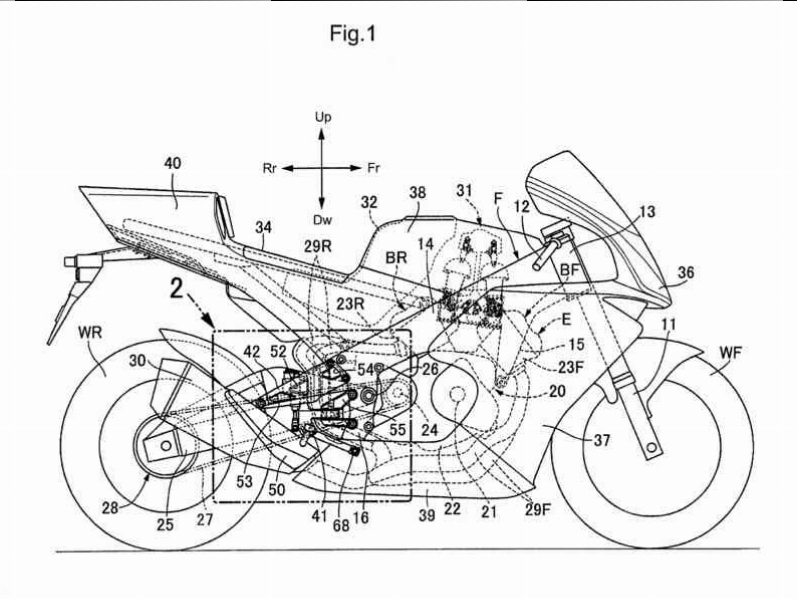 Patent Title: Step structure of motorcycle. 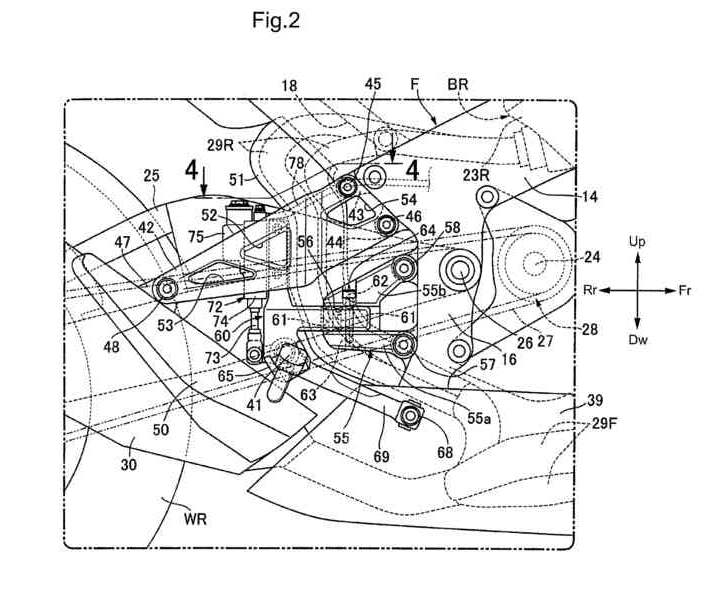 Patent Abstract: A motorcycle with a reduced number of parts for a step structure to achieve a compact and simple structure. The motorcycle includes an engine main body of an engine, which exerts power for driving a rear wheel. The engine is mounted on a body frame with a main step on which a rider’s foot is placed being supported on the body frame. An exhaust muffler, to which exhaust gas from the engine main body is introduced, is supported by a muffler stay attached to the body frame. A muffler stay, which is attached to attachment portions provided in a body frame above a main step, extends downwardly toward the rear from the attachment portions and functions as a heel guard for a rider placing his/her foot on the main step. The present application claims priority under 35 USC 119 to Japanese Patent Application No. 2015-157051 filed Aug. 7, 2015 the entire contents of which are hereby incorporated by reference. The present invention relates to a motorcycle in which an engine main body of an engine, which exerts power for driving a rear wheel, is mounted on a body frame with a main step on which a rider’s foot is placed being supported to the body frame. An exhaust muffler, to which exhaust gas from the engine main body is introduced, is supported by a muffler stay attached to the body frame. More particularly, the present invention relates to an improvement in a step structure. Japanese Patent Application Publication No. 2013-226977 discloses a motorcycle wherein a pillion step bracket is provided for supporting a pillion step with a muffler supporting part for supporting an exhaust muffler being provided in a rear end part of a pillion step holder, which is attached to a body frame above a main step and extends upwardly toward the rear. A cover member, which is formed as a member separate from the pillion step holder to function as a heel guard for a rider placing his/her foot on the main step, is arranged above the main step in such a manner so as to cover a front part of the pillion step holder. 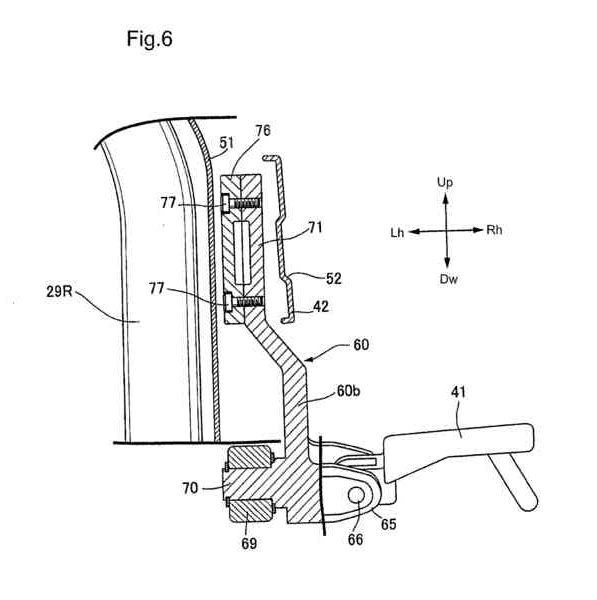 However, since the pillion step holder and the cover member are separate members in the structure disclosed in Japanese Patent Application Publication No. 2013-226977, the number of parts increases, and the structure around the main step becomes complex. Also, since the pillion step holder extends upwardly toward the rear from the body frame, the pillion step holder becomes enlarged. The present invention has been made in view of the foregoing, and aims to provide a step structure of a motorcycle, which can be formed of less parts and be downsized, and can achieve a compact and simple structure. According to an embodiment of the present invention, a motorcycle is provided having an engine main body of an engine, which exerts power for driving a rear wheel, wherein the engine is mounted on a body frame. A main step on which a rider’s foot is placed is supported on the body frame with an exhaust muffler, to which exhaust gas from the engine main body is introduced, being supported by a muffler stay attached to the body frame. The muffler stay, which is attached to an attachment portion provided in the body frame above the main step, extends downwardly toward the rear from the attachment portion, and functions as a heel guard for the rider placing his/her foot on the main step. According to an embodiment of the present invention, a foot positioning portion opened at least on an outer face of the muffler stay in the vehicle width direction is formed in the muffler stay, in such a manner so as to accommodate part of the rider’s foot placed on the main step to determine a position of the foot on the main step. According to an embodiment of the present invention, a main step stay is fixed to the body frame with a step movable-support member arranged on the inner side in the vehicle width direction of the muffler stay being supported to the main step stay, in such a manner so as to be movable in the longitudinal direction within a limited range. The main step is provided in the step movable-support member. A longitudinal length of the foot positioning portion is set larger than a longitudinally movable distance of the step movable-support member. According to an embodiment of the present invention, a brake pedal for putting a brake on the rear wheel is arranged in front of the main step. 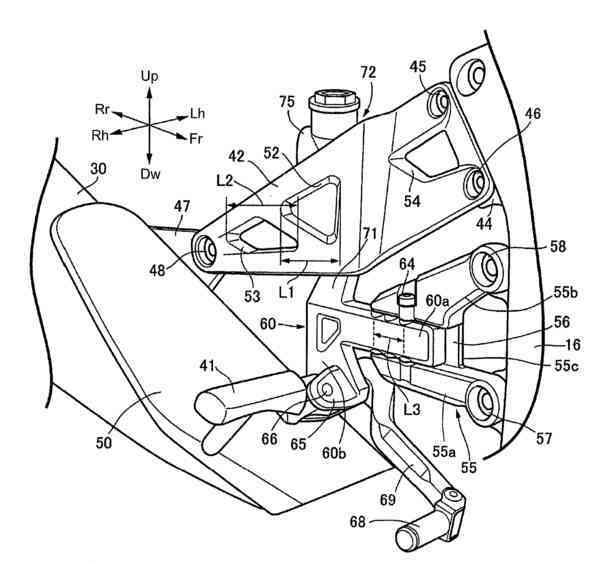 A master cylinder unit, which outputs hydraulic pressure of a brake according to a pushing operation of the brake pedal, is supported to a master cylinder unit attachment portion provided in a rear part of the step movable-support member. 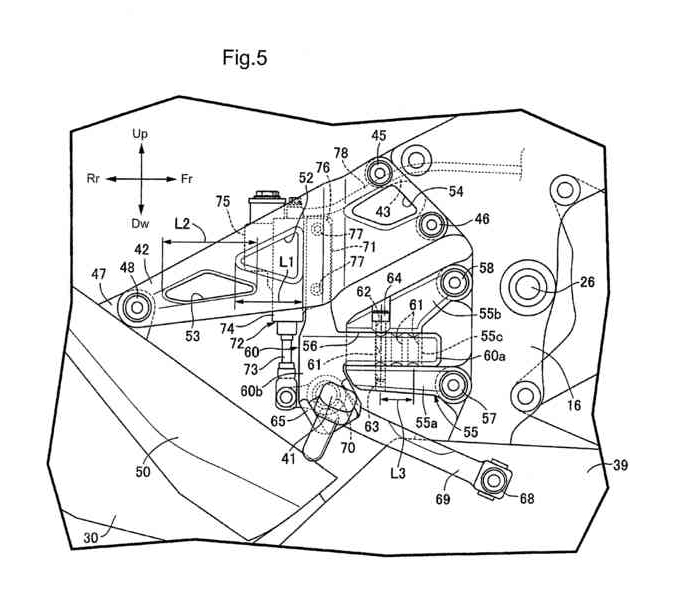 The master cylinder unit attachment portion and the master cylinder unit are arranged in positions where they move in the longitudinal direction, on the inner side in the vehicle width direction of the muffler stay. According to an embodiment of the present invention, a brake hose connected to the master cylinder unit is arranged on the inner side in the vehicle width direction of the muffler stay, in such a manner so as to partially overlap with the muffler stay in a side view. According to an embodiment of the present invention, since the muffler stay functions as a heel guard, there is no need for an exclusive member for a heel guard, which makes the downsized step structure with the reduced number of parts. Also, the structure around the main step can be downsized and simplified. According to an embodiment of the present invention, the foot positioning portion opened at least on the outer face of the muffler stay in the vehicle width direction is formed in the muffler stay, and determines the position of the rider’s foot placed on the main step. This facilitates the rider’s operation of the vehicle. According to an embodiment of the present invention, the step movable-support member, on which the main step is provided and which is arranged on the inner side in the vehicle width direction of the muffler stay, is supported by the main step stay fixed to the body frame, such that the step movable-support member is movable in the longitudinal direction within a limited range. Thus, the position of the main step can be adjusted according to the rider’s build. Moreover, the longitudinal length of the foot positioning portion formed in the muffler stay is set larger than the longitudinally movable distance of the step movable-support member. Thus, even when the position of the main step is moved in the longitudinal direction, the foot positioning portion can determine the position of the rider’s foot placed on the main step to facilitate the rider’s operation of the vehicle. According to an embodiment of the present invention, the master cylinder unit, which outputs hydraulic pressure of a brake according to a pushing operation of the brake pedal, is supported to the master cylinder unit attachment portion provided in the rear part of the step movable-support member with the master cylinder unit attachment portion and the master cylinder unit moving with the step movable-support member, in the longitudinal direction on the inner side in the vehicle width direction of the muffler stay. Thus, a space on the inner side in the vehicle width direction of the muffler stay can be utilized effectively, and mass centralization and downsizing can be achieved. According to an embodiment of the present invention, the brake hose is arranged on the inner side in the vehicle width direction of the muffler stay, while partially overlapping with the muffler stay in a side view. Thus, the brake hose can be made less recognizable to improve the appearance of the motorcycle, and the structure around the muffler stay can be downsized.